After the old Seljuk kingdom in Anatolia (Turkey) fell apart, one of these Seljuks, a man named Osman, started in 1299 AD to build a new kingdom – the Ottoman Empire. At this time, the Byzantine Empire was very weak from the Fourth Crusade. In 1347 AD, the Black Death weakened the Byzantines more, and weakened the Mongol Empire, too. The Ottoman sultans took advantage of this and crossed over from West Asia into Europe in 1352 and began conquering Greece and the Balkans. In 1361, the Ottoman sultan Murad I captured Adrianople, and in 1386, Sultan Bayezid I captured Sofia (modern Bulgaria). Bayezid may have also conquered the Saxons of New England, north of the Black Sea in Crimea. But even though the Ottomans were conquering Eastern Europe, they had trouble back home. The Mongols regrouped under their new leader Timur and attacked the Ottomans in 1400 AD. The Ottomans lost a lot of their West Asian land to Timur – maybe including Saxon New England. And they were so distracted by the Mongol attack that their invasion of Hungary also failed. Bayezid was so upset that he killed himself. Because they were losing their battles in West Asia, the Ottomans focused more and more on Europe. They fought many wars with Venice over control of Eastern Mediterranean shipping routes. In 1453 the Ottoman sultan Mehmed II and his Janissaries (his special forces) even conquered Constantinople from the Byzantine emperors, ending the last piece of the Roman Empire. 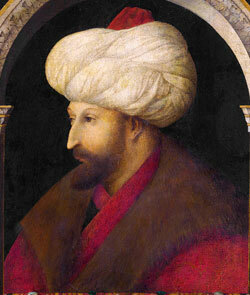 Mehmed got the leading Venetian painter of his time to come to Constantinople to paint his portrait. Leonardo da Vinci designed what would have been the world’s longest bridge for Mehmed’s son, Sultan Bayezid, in 1502, though Bayezid was afraid it would collapse and didn’t build it. In 1492, when King Ferdinand and Queen Isabella made all the Jews leave Spain, many of them came to live in the Ottoman Empire, where the Ottoman sultans welcomed them and let them follow their religion. Once they had conquered Constantinople, the Ottomans started to think of themselves as the new Roman Empire. In 1517, the Ottomans defeated the Mamluks and ruled Egypt, and slowly they conquered the rest of North Africa too, ending with the Marinids in Morocco. Cite this page: Carr, K.E. Ottoman Turks – Medieval Islamic history. Quatr.us Study Guides, July 25, 2017. Web. April 21, 2019.